DATIN: Ready for the ROAR! RF: If you could describe in one sentence where you are in life right now, what would you say and why? DATIN: Being still. This is the season where I’m about to jump off the plane and the skydiver instructor is the Lord and waiting when he pushes me. I don’t get to choose on when to jump. When the Lord pushes, I trust and let Him lead me. Right now, I’m putting my all in my art. It can be a nervous time, but I also know the Lord is leading me. He has been dealing with me about going full-time in ministry. I know rappers who are struggling financially and cannot do that. It’s easier to rely on a bi-weekly paycheck but I have to trust Him in every area of my life. Since the age of 14, all I’ve known is work — and I ready to work for His glory! It can be nerve-racking, but man — I have God’s peace. That peace has not misled me. Right now, it’s a privilege to hear the voice of God. The same voice is telling me TO GO! I have to go! And may it be for God’s glory! RF: You have many around the country who are supporting your work and the message. Who would you consider your biggest supporters/backers? DATIN: My wife (Johely), Lionel (King), my new family in Florida (who have been extremely supportive) and my Christ Church (New Jersey) family. I can always rely on them to support, to build me up and strengthen me during the most difficult times. I’m thankful bro! RF: Every life should be about a cause. You haven’t shied away from that. How would you describe your life’s cause? What are willing to sacrifice for and die for? DATIN: Dude, that’s a good question. Solely to make disciples and to share the same medicine that saved me. Everything else is secondary. Even the secondary things are for God’s glory. When I serve my wife and my daughter – I want to raise and serve for the glory of God. It’s about His glory. I don’t want to do anything that distracts from that. RF: Since signing with God Over Money (GOM is Datin’s label), what has changed? DATIN: GOM has been good to me. Bizzle (rapper) shares his platform with me. After signing with GOM, it has taken things to a whole new level! It’s not simply a label – it’s a family! Me and Bumps, Selah and Bizzle — we are real friends and family. It’s beyond business. It’s personal. They hold me up, keep me accountable and have helped me along this journey. I’m beyond grateful. RF: Let’s talk about THE ROAR. ROAR stands for Rise of a Revolution What are most excited about the album? DATIN: Ryan, you can’t ask me that man! 🙂 I can’t wait for people to hear this. When you’re in the studio and recording, you’re feeling good about the lyrics, music and production. But, when it is done, you start questioning “Is this good enough? It’s time to peel the bandaid. I’m ready for this man! I want people to be blessed by it. I want to make good art that glorifies the Lord. There are things on this album that are prophetic. Am I saying this because it raps and rhymes? No. It is speaking to what we are dealign with right now. For example, the single Hallelujah All Day – I talked about persecution and I’m seeing the rise of ISIS. I wrote “HAD” a couple of years back. Or when I talk about baphomet symbolism and devil worship. You then see DRAKE putting out cover art with the devil worship symbolism. Now, the baphomet statue is going on tour. I see how God used the music on THE ROAR to prophetically speak to these issues. 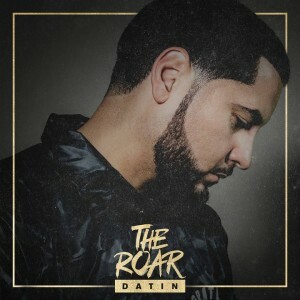 DATIN’s THE ROAR cover caused many to raise their eyebrows and celebrated by those who feel it represents his music well. RF: I know there has been some controversy swirling around the shock value of the album cover for THE ROAR. Do you care to address it? DATIN: At first, I wanted to rebuke it but then received a revelation. God inspired a thought. Bizzle didn’t want it thinking it was a bit too much. But, I knew this was speaking to the core of the music. I wanted The Lion, which symbolizes the Body of Christ starring and roaring at the barrel of the gun, symbolizing the face of death. The guy holding the gun, suited guy like an angel symbolizes persecution. In other words, the world is trying to keep us quiet and cause us to embrace lukewarm Christianity and legalism. It’s an anti-Christ spirit. But, we need to ROAR the gospel everywhere we go! RF: You’ve heard the criticisms and read the posts about your music, tone and even demeanor appearing demonic or angry? You responded through your music to those criticism. But how does that make you feel when you are trying to rep Christ? DATIN: Ryan, it’s about the love we share. It bothered me because it’s not who I am. Like on the song HAD ENOUGH, I’m here saying, “you’re not out here. You’re behind a keyboard. We out here representing the Kingdom!” When the put out OFF THE LEASH and we heard the criticisms – my first reaction was laughter. I couldn’t believe it because God had a plan already in the works. We had already planned to send out HAD ENOUGH featuring Bizzle and it was a revenant rebuke! God knows my heart and he provided a prophetic flow. I’ll let the music speak. RF: What do you think is the state of CHH now? Here’s what I like: That’s its growing and opening up doors for artists. Artists like JGivens, who I know he has a heart for Jesus, given a great platform. Here’s what I hate: I hate that it is becoming an idol (too many false motives). 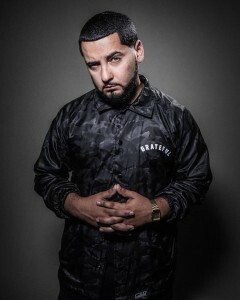 CHH (Christian Hip-Hop) is becoming the pastor and church rather than becoming discipled. CHH has their own followers. This is not how it’s supposed to be. We need more discipleship and more accountability. Every rapper should have church covering. I hate that Jesus is being removed from it. When I say this, most may misunderstand and automatically point to well known artists like Andy Mineo & Lecrae. Here’s the thing – they are doing what they are prompted to do by God. I want to make sure all of our motives are pure. For example, that’s why I like to lay down my track first when collaborating. I don’t want body anybody on a song. PRIDE – It’s the elephant in the room. When I see it, I just say “Stay right there in the corner, pride!” Otherwsie, I will be on my back. RF: For those who are watching your career and hearing your music and are inspired to do the same, what would say to them? DATIN: Don’t be stupid – don’t think you can get around God’s truth. Seek first the Kingdom of God and His righteousness and all these other things will be added (reference: Matthew 6:33) There is nothing I have done but where God has told me to do and go. 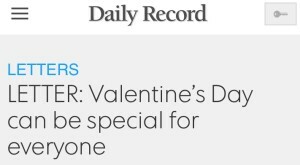 I didn’t make these deals. God supernaturally orchestrated it! My salvation and my walk is divinely orchestrated! Seek God in prayer, read His Word and obey! It ain’t all pretty. But, it is always a privilege to serve the Master. DATIN is signed to God Over Money (GOM). 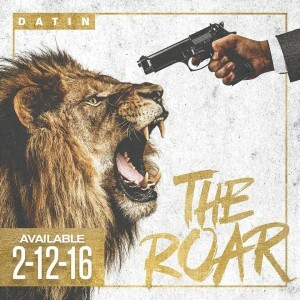 DATIN’s new album, THE ROAR, is available on Friday, February 12th on God Over Money. http://ryanfaison.com/wp-content/uploads/2016/03/RF_Color-Logo-02-1030x705.png 0 0 Ryan Faison http://ryanfaison.com/wp-content/uploads/2016/03/RF_Color-Logo-02-1030x705.png Ryan Faison2016-02-08 11:59:332016-02-08 12:11:14DATIN: Ready for the ROAR! In our culture today, we are witnessing the splintering of peoples amongst class, race, ethnicity, geography, education and gender. 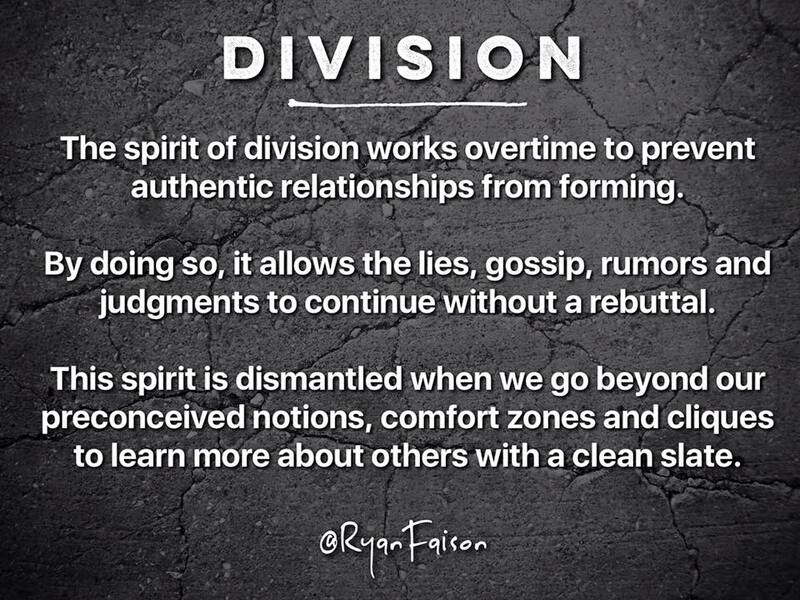 Here are my thoughts on division and the spirit behind it.